John Bolton is President and CEO of Craft Beer and Brewing Magazine. John previously built a large publishing business in 2007 and has now made the transition to Beer publishing and mixed media. Dave Carpenter is contributing editor for Craft Beer and Brewing Magazine, and is an MIT graduate who left Aeronautical Engineering to pursue a career in writing and brewing. We start with a discussion about some of the new trends we are seeing both in craft lager beers and lager brewing. John explains refrigeration and some options home brewers have for proper fermentation temperature control of lagers. Dave suggests some additional options for refrigeration, including freezer conversion. John and Dave explain why healthy lager yeast is important for lagers and also why roughly double the amount of yeast is needed (along with a good starter) to get strong fermentation on a lager. Dave provides some tips in ingredient selection for a good lager. 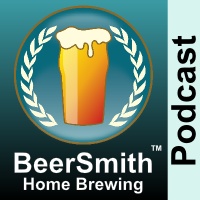 We discuss how many traditional lager styles boundaries are being broken both by home brewers and craft brewers. Thanks to John Bolton and Dave Carpenter for appearing on the show and also to you for listening!